2013 seems to be the year of excessive hand-wringing about our digital-dominated present. I've indulged in some of it myself. When we're not bemoaning the deaths or slow death pangs of totemic rituals like record store shopping; bookstore browsing; long, contemplative reading; and analog-based cinema, we're fretting that our children are organically moving away from the necessary sorts of book-learning that helped make each of us whom we are today (for better or for worse, right?) - and that we've created a short-attention-span generation that is already rewiring itself into a cohort that's, well, dumber than previous generations. It may all be very much true. I certainly have my worries. Stephen Apkon turns the nervous blabbering into something quite a bit more realistic and hopeful for today's digital denizens; his book title, "The Age of the Image: Redefining Literacy in a World of Screens" truly says it all. Apkon helped to found the Jacob Burns Film Center in New York City, and teaches both aspiring filmmakers and collaborates with students of the visual form there. He's strongly invested in evolving our understanding of the cultural world in which we find ourselves, and he's an excellent writer and transmitter of both fact and opinion. The first half of his book is exactly what I'd hoped it will be: succor for a nervous digital-age dad that the move toward visual literacy, as opposed to written-word literacy, isn't such a bad thing after all. 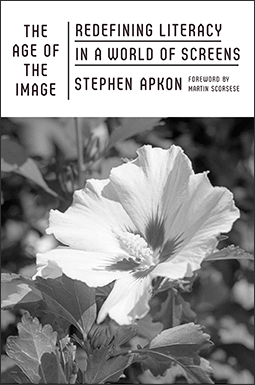 Apkon confirms and relays much of the recent scientific literature that our brains are wired to accept, understand and retain visual imagery much better than we do the written word. Words on paper, unlike things we can see with our own eyes, either on the Serengeti plain or on YouTube, are a fully human construct. We forced this method of learning and understanding upon ourselves several centuries ago, and yes, it has served us well. Now technology has reached the stage - and the affordability - that we can tell our stories in a manner even more conducive to actual retention and understanding, something that our brains understand, retain and appreciate even more. As a lover of great film who can easily be brought to tears through a fantastic image or film sequence - I'm thinking right now about the first zoom directly into Liv Ullmann's face when Erland Josephson tells her he wants a divorce in Ingmar Bergman's "Scenes From A Marriage", which made me pause the VHS tape and catch my breath and dab my eyes when I first saw it fifteen years ago - I'm fully bought in to how powerful and incisive the visual image can be in the hands of a great director. Like Apkon, I'm in no hurry to see book-learning die, either. His premise that we all need to understand and appreciate the conventions of visual imagery - how they're made, how they can be manipulated for good and for ill, and what tools are available for each of us to engage in making them - is spot-on, and I'd like to see his manifesto help to prod the educational establishments in each of our respective countries into a modest curriculum shift. I'm sold. The book took a wicked left turn about two-thirds of the way in that I wasn't expecting at all. Apkon goes full-on professor all of a sudden, and extends his thesis into practical instruction on how to make a film (even if that film is only a 2-minute smartphone video). What is a producer? How do you set up your lighting? What apertures should you consider? That's where I stepped off the book for a chapter or two, in order to rejoin later for the concluding chapters. Perhaps it's because I'm a know-it-all fortysomething who doesn't need nor want to learn how to make a film. Perhaps I'm good enough already at understanding what goes into image-making, even if I don't do it myself. Or maybe I was just looking for a sociological and cultural overview of the state of visual learning and visual technology, and how it compares to our traditional way of understanding literacy, and wasn't looking for a hands-on practicum. Regardless, I got what I wanted out of this book, and I found it be a very good thought-provoker. Others might approach the book from different angles, and that's good - he's certainly got a couple of different angles from which to approach it.